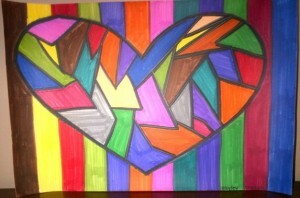 Congratulations to the OVERALL WINNER – Haley Zimbric, 6th Grade, Watts Middle School! Haley Zimbric, a sixth grade student at Hadley Watts Middle School, is the overall winner of the Centerville Diversity Council’s Art Contest that drew 148 entries from all of the community’s schools, both public and private. In all, there were nine winners in three categories: K-2 (82 entries), 3-5 (47 entries) and 6-12 (19 entries). The contest began in September. A panel of three judges chose winners. They are Laurie Montano, an artist, a member of the Diversity Council and a former member of the Centerville Arts Commission; Georgia Mergler, of the Centerville Library and a member of the Diversity Council; and Ginny Strausberg, a member of the Centerville Arts Commission. 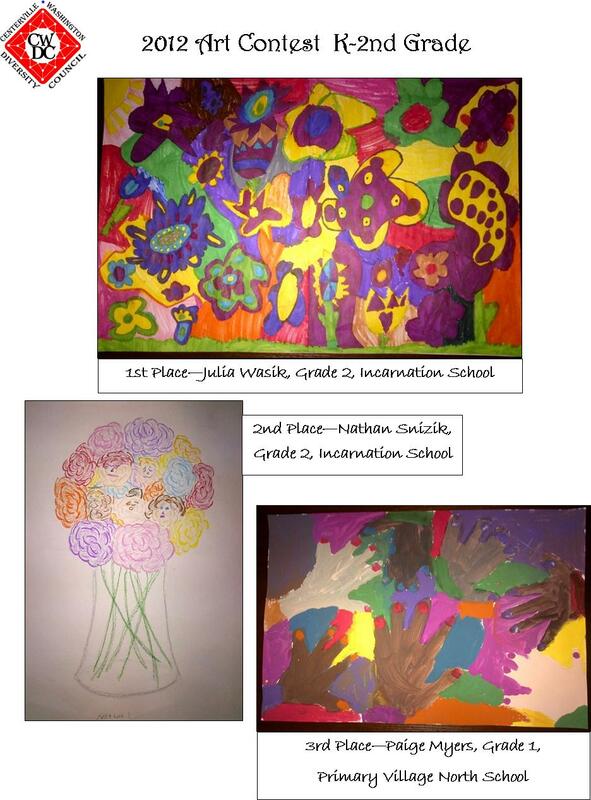 In the K-2 grade category, Julia Wasik, second grade at Incarnation, won 1st place, Nathan Snizik, second grade at Incarnation, 2nd place; and Paige Myers, first grade at Primary Village North, 3rd place. 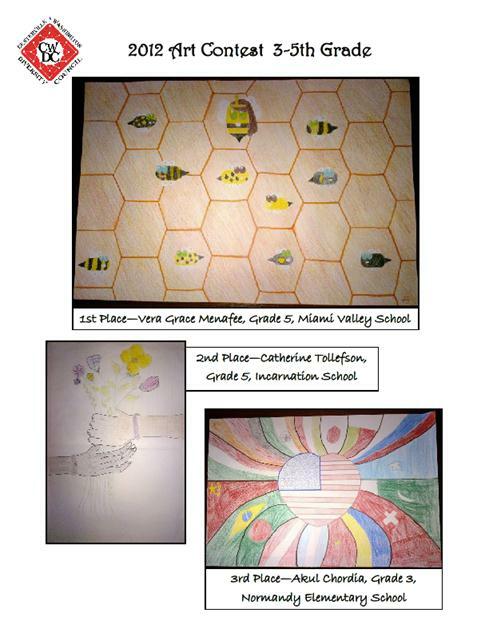 In the 3-5 grade category, Vera Grace Menafee, fifth grade at Miami Valley school, won 1st place; Catherine Tollefson, fifth grade at Incarnation, 2nd place; and Akul Chordia, third grade at Normandy Elementary School, 3rd place. 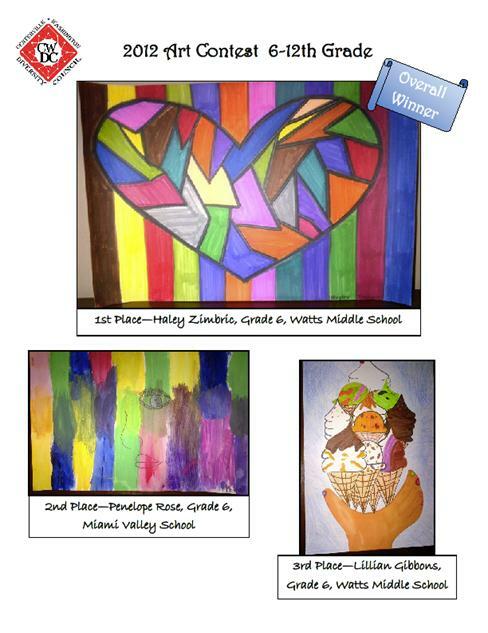 In addition to being named the overall winner, Ms. Zimbric won 1st place in the 6-12 grade category. Penelope Rose, sixth grade at Miami Valley School, won 2nd place in this category and Lillian Gibbons, sixth grade at Watts, won 3rd place. View the winning entries here! Thanks and congratulations to these talented students in our community! To celebrate the many ethnic and cultural backgrounds, family structures, religions and abilities in the community, the Centerville-Washington Diversity Council is sponsoring an Art Contest this fall. The contest is open to children ages K through 12. Finished artwork must be submitted to the child’s school by Friday, November 16. Awards include one overall, three gold medals, three silver medals and three bronze medals. Winners will be recognized at the Diversity Council’s Martin Luther King. Jr. breakfast at Yankee Trace on January 21, 2013. Teachers in every Centerville public school and various local private schools will distribute contest rules and a submission form, along with paper for the artwork. Drawing paper is provided courtesy of United Art and Education. Contest rules and a submission form also are available here: Art Contest Entry Form. Students may use their own 12” X 18” paper if preferred. 1) Contest is open to children ages K-12. 2) Only one entry per student. 3) Artwork must be on 12” x 18” clean, unlined paper. If you need paper of this size, it is available through the child’s teacher. 4) Three-dimensional entries will not be accepted. Nothing may be glued, stapled, or attached to the artwork. 5) All media on paper are accepted. Chalk, charcoal and pastel entries should be sealed with a fixative spray to prevent smearing. 6) The use of lettering or numbering on the front of the poster, in any language, is not allowed. Signatures of first names and last initials are allowed. 7) The submission form must be completed and affixed to the back of the artwork. 8) Artwork will be used by the CWDC for its promotional materials and will not be returned.